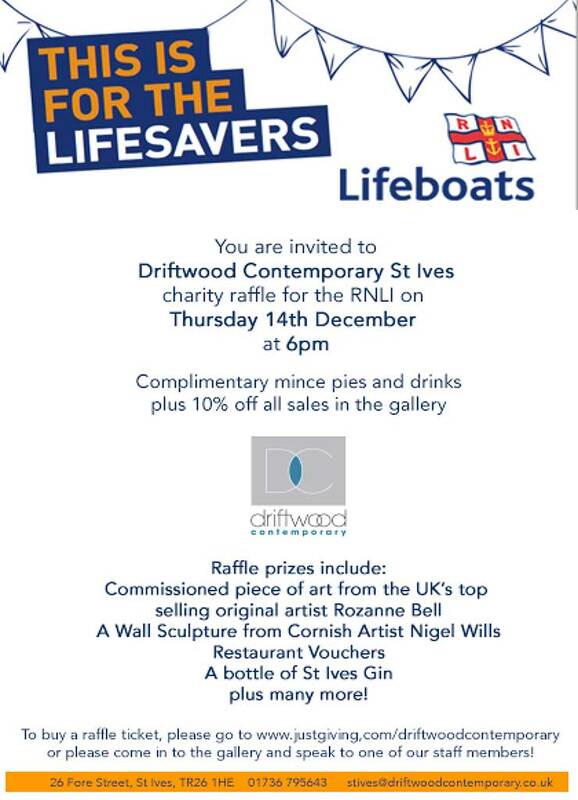 Thursday 14th December from 6pm for the RNLI. “Please come and join us for complimentary mince pies and drinks. Rozanne Bell – The UK’s top selling original artist will be commissioning a special painting for the event. Also included in a generous donation to this very worthwhile cause will be a Wall hanging Sculpture from renowned Cornish metal sculptor Nigel Wills, a representational sculpture of a sea bass, this iconic Cornish fish will also be included in this enticing raffle along with lots of other amazing prizes. We will be offering 10% off all artwork sold on the evening of the event. Raffles tickets are £1 each. 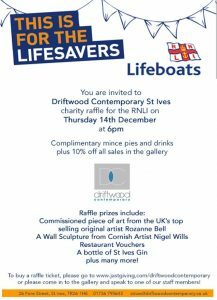 Contact details are: 01736 795643 or stives@driftwoodcontemporary.co.uk.